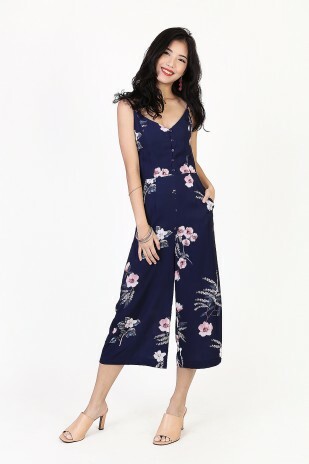 An one-piece jumpsuit is simply the most effortless style this season, therefore we want to bring you that convenience of picking your outfit! Enhanced by traditional elements found in a cheongsam, this piece is equally as festive-ready as your dresses. Made of thick linen and polyester blend. Comes with back concealed zip.Top satin lining. 2 side pockets. Slightly stretchable. Do refer to white background studio photo for color.